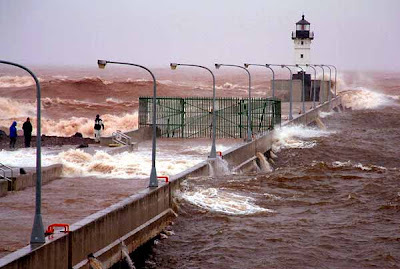 These images are a great representation of just how huge waves on the lakes can get even along the shoreline at Duluth and other communities surrounding these sometimes wild lakes. 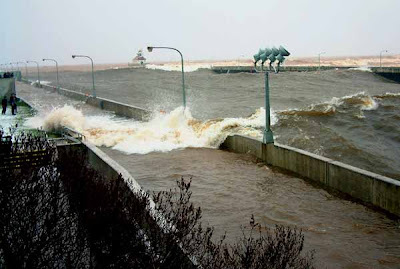 These waves were unusually large from a storm that brought winds of the perfect direction that built up full fetch wave heights which funnel into Duluth harbor, waves that were generated over 200 miles away in eastern Lake Superior. The current US national weather map is beginning to look a lot like autumn as we have a trough of much cooler air from the Gulf of Alaska that’s slicing, albeit breif, the heat across California which has been baking them for nearly a month now. 90s will soon be 70s and normal temps for the LA Basin and 80s for the inland valleys whilst 90s will be the name of the game across the deserts. I am sure there must be some that reside out in Baker, Lancaster, Palm Springs and Death Valley that breathe a sigh of relief when they finally see a cold front that manages to drop into the desert and clean out some of that shifling hot air that’s been around since May. Unfortunately for some, great for most, Southern California will likely see on and off warming as troughiness progresses speedily eastward from out of the northwest and high pressure that bobs around the southern states will work with increasingly stronger troughs that swing in from the Pacific and may enhance the formation of Santa Anas which will likely warm them up, however a long term warming trend is now unlikely since the pattern is changing and with the El Nino, though we may not see bucket loads of rain, we may see at least an enhancement in the coming months, increased rains may mean less warmer of a winter than the past few that has been much drier than normal thanks to La Nina driven Southwest high pressure dominance and a storm track over the central and northern West Coast. As for the heart of the United States, we see a stormy set up across the Plains as well as a Rockies storm system that has downright cold air attached to it, this storm that rotates chilly north, northwest winds in behind the low pressure center out of Canada will bring enough chilly air in behind it and enough precipitation that we may see an early season snowstorm for the Northern and Central Rocky Mountain States. I expect some 6-12 inch accummulations and winds of 30-60 mph, particularly in exposed roads and communities. Days will see highs in the 40s, with highest areas seeing highs in the upper 30s, wind chills below 30? Yes. Nights that see clearing skies and calming winds once the storm system moves east may see temps drop off into the low 20s with even some teens in the lower lying sheltered areas that have several inches of snow on the ground..
How about the Great Lakes and Northeast portion of the country? Gales of November come early? Gales of September! Well a strong storm system that’s now pulling east over Quebec and dragging it’s wind field core into the east lakes has produced powerful tree-stripping, cold winds that have kicked up choppy swells on all of the Great Lakes. A real autumnal look and feel for this region as winds will feel raw and swells on Lake Superior were expected to top 15-20 feet. Lake Michigan may see some strong north winds roar down the full fetch of Lake Michigan which could create 15 foot swells along the Indiana and Michigan shore. On Sunday a gust clocked at 54 mph was clocked in the Twin Cities whilst Willmar, MN clocked a gust at 66 mph. The reason for such high winds speeds even over the Northern and Central Plains as well as along the shores of the Lakes (with likely strongest winds unreported over the surface of the lakes as there is no frictional drag from land) is that the pressure gradient is tightened when you get a strong high and strong low along side each other. The interaction between high and low generates strong winds, the stronger the high and low as well as how close they are to each other, means stronger winds. The conflicting atmospheric pressure means the wind must blow harder to keep atmospheric balance. Why is there the so called “Gales of November” found across this region? 1) Warmth from late summer is still roaming across the southern states, whilst progressively colder air is penetrating south from Canada. The collision of late season warmth and early season cold creates a low pressure center to deepen, even bomb out because of 2) the southward advancement of the polar jet due to building of cold air 3) the tightening up of that jet due to increasing temperature contrast (collision of cold, dry, polar air and warm, moist equatorial air) and the warm surfaces of the Great Lakes all comes together to create a ferocious gale-center that spin over the lakes and creates fury at the surface of both water and land. Often there will be a high to the west and this will enhance wind speeds like we’ve seen with this weekend’s example. 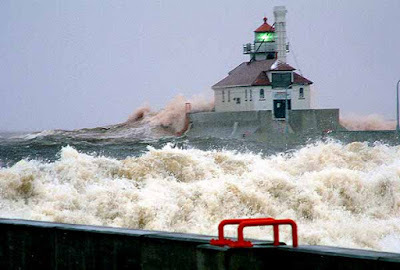 You get powerful winds that cross the surface of the Great Lakes and this wind transfers energy into waves, the stronger the winds blow, the more energy goes into the waves, therefore making them larger as they ride the wind that drives them. For maximum wave height, the wind direction is key as well as wind speed. Turn a gale force wind easterly over Lake Superior or north over Lake Michigan, and you have over 200 miles of lake water to build the wave. When gale or even hurricane force winds roar over the lakes and the alignment of wind is such that it’s rides across or down the entire lake length, that is generally how you get those 20 to 30 footers and this is why we hear from history of many ships that have sank in the lakes, everything must come together perfectly, like the perfect storm. Because of a large high centered over the Rockies, the winds intensify as the low and high squeeze the isobars that seperate them, they therefore generated a gust to 59 mph at Buffalo, SD (well west of the lakes). High wind speeds can be witnessed over the flat plains since there is less barriers to break down the wind flow and speeds achievable with little mountains and trees etc. Though even this isn’t as good as a water surface where there is even less friction. This very low now centered and spinning northeast will weaken as it moves away from the warm surface of the Lakes, the late summer is when these bodies have maximum heat in them and therefore is an additional energy booster outside of baroclinic atmospheric properties that drive these low’s that cross west to east. Winds will also lighten up as the contrast and fight in pressure between high and low speeds out and a final factor in their weakening process is that they enter a much more uniform colder environment than further south where there is still warm, moist and tropical origin air to tap. Behind this northeast advancing low, the national air space is cleaned out. The front that moved out ahead of the storm center created severe weather across the Ohio Valley and Western New York as the warm, humid air pushed northward ahead of the front as the air temp contrast was conducive for convergence at the surface and divergence aloft. Also the Canadian origin air is making for chilly nights even down across the southern states for the first time since March and April. The low that will produce snowfall throughout the northern Rockies will move east and with much cooler air across the northern tier, we may see snowflakes fly across North Dakota as well as northern MN and WI and perhaps northern Michigan. We shall see. An interesting set up. Oh, by the way, another cold pool even stronger than what we will see across the northern tier may drop south in the next week to 10 days and bring cooler days and nights. Snowfall for the central and southern Appalachains may be possible.